(4% off on orders over $199)* When building a cart worth at least $199 of bundle items, you get 4% off all bundle items on the entire site. 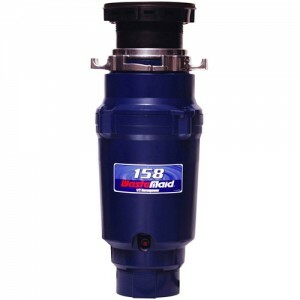 The Waste Maid WM-158 is a Standard Grade Garbage Disposal manufactured with a ½ HP grinding motor that is powerful enough for standard household disposal needs. The WM-158 fits easily under most sinks and installs quickly. Replacing your old garbage disposal is easier with a Waste Maid with the attached Power Cord (preventing the need of hardwiring). The WM-158 operates on your standard household 120V line voltage and is a good replacement for any ½ HP model. Waste Maid Garbage Disposals use Bio Shield technology, which is incorporated in all mechanical plastic parts that come in contact with food particles. The Bio Shield anti-microbial design eliminates the build-up of bacteria and germs, causing odor and potential malfunction. Additional features include the patented TorqueMaster Balanced Grinding technology, using a turntable styled grinding operation that is more efficient and puts less stress on the disposer components, providing a longer lasting and quieter operating unit for many years to come. Septic Tank Safe. The Joneca Corporation, a leading distributor of Garbage Disposal products in over 50 countries, including the USA, UK, China, and Japan. Waste Maid branded products are made of the highest quality standards. The Joneca Corporation has been a leading distributor for nearly 25 years. There are no reviews for this product yet. Be the first to review the product! Please login or register before adding a question. Enter ZIP code to get local Promos change zip? * Limited to the 48 states.